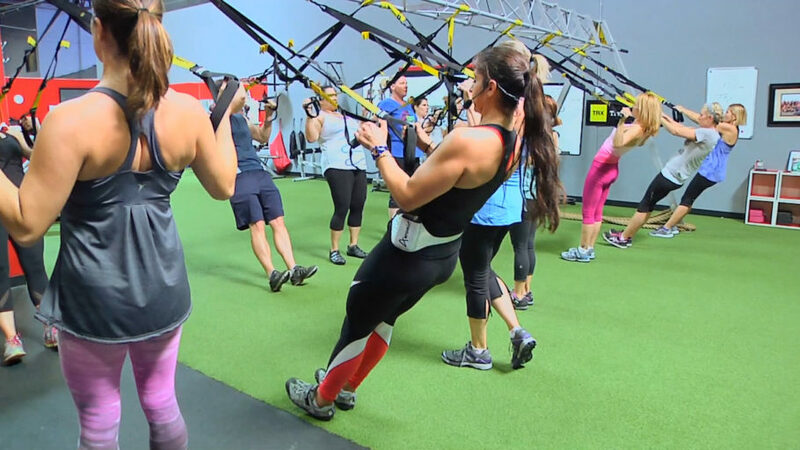 Burn fat and build muscle with this fast paced total body TRX and Indoor Cycling workout, which includes short-but-intense intervals, full-body strength moves, and an extra dose of abdominal work! You will be on the bike for the first half of the class crushing a series of hills with some longer climbs, flats, and sprints with shorter recovery times. Then a quick transition is made to the TRX for the second half, as we work on burning more fat, and sculpting that body!! This class has 30 second timed intervals guaranteed to keep your heart rate pumping and burning mega calories while you’re engaged in intense body conditioning. Get to it! Pre-drive to 25. Count it as (0) Halima is a machine. What a workout. Halima, great class! I liked the TRX trick to place your toes facing up in the foot strap portion then turning your body into a downward facing plank. That was a breakthrough key for me to do those downward facing exercises! Thanks for the tip! FFS…i love the hill work and I really like that you tell us where our heart rate should be. That’s really helpful. Great class, intense buy loved the motivation by Halmia! Drive to 25! Loved it! The music was awesome! Thank you so much! Its obvious, many are missing out bot a lot of comments. I love this class!!! TRX and the Spin!!! Great class! Only had time for the spin portion but after 35 minutes had already burned 330 calories. Looking forward to when I can do second half. you brought it. love the addition to ssod. 1. I enjoyed this workout to the max! 2. I LOVED your music mix! Oh my gosh! ! Awesomeness!!! What an awesome workout. Love everything about this. So challenging. Loved your personality. Definitely a favorite!! Welcome, Halima. We are so blessed to have you at SSOD. I appreciated your smiling encouragement, spot on verbal cues and TOUGH workout! Great class! I’ll be feeling my legs tomorrow! Fantastic class, Halima! Loved the heavy bike work. Super challenging and I definitely have room for improvement. The TRX was solid. This class went straight to favorites. Glad I’m coming off my rest day, because my legs feel it! style. Let’s see what your made of! Ummm… description, huh? I’m going with, “NOT… EASY!” Ha! 35min of calorie crushing cardio on the bike worked around 4 Challenging Core-centric traditional & Tabata TRX Sets, where the abs are forced to balance you as the entire body is strengthened rep by rep. The audio cuts, but watch and play along and you’ll do just fine. GIT IT! 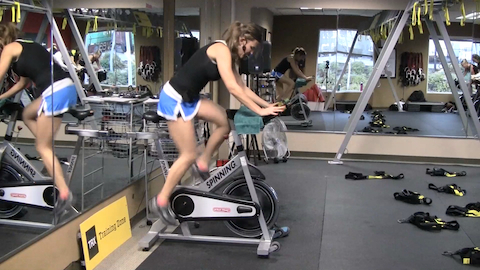 TRX Spin: Get it Started! Get a quick TRX® Training Intro as Cat begins by walking you through TRX® terminology & basics. Next we pack what feels like a full 60 minutes of riding into a 25 minute all out, body pumping, killer cardio & strength blast where if you’re not climbing hard you’re racing fast. Finish with a solid head to toe 30 minute core driven TRX® workout. Now that’s a sweet workout! Many of you will see a P.R. 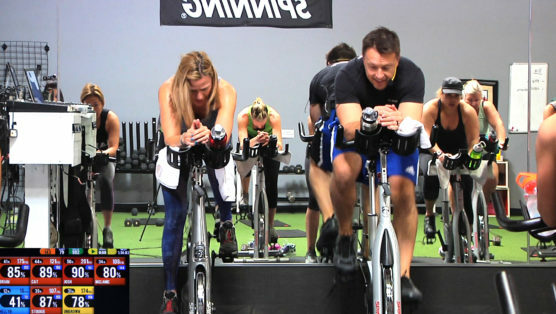 (personal record) for calorie burn in this Killer Spin Sculpt Fusion class, as 2 of Studio SWEAT’s most popular trainers, Cat & Brian, bring the heat! The format is simple… we ride, we sculpt on the floor, then we ride some more. There’s a perfect combination of fat frying interval and endurance drills, as well as power climbs and fast flats. Clearly the riding is awesome, but the body-toning floor work is just as incredible. Expect to fire up every major muscle group in a fun format, and using the tool(s) of your choice (either just dumbbells, or a combo of TRX and dumbbells). FIRE IT UP!